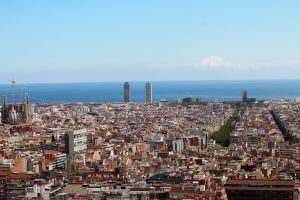 The sky above Barcelona remains a perfect, shiny, blue, and we approach our window with the vague hope that today will not be a chilly day, but…it seems that this 2017 has skipped Autumn, and we have no alternative but to feel and accept how, for the last few days, the temperature has dropped down. These changes are often reflected in both our daily activities and our skin. The lack of sunlight affects our emotions and often disorient us. That’s why it is time to let go of everything that of no use in our lives. Just take a look at how Nature herself sheds away all of its old leaves and bushes and prepares for a new cycle! The key for these cold times is to both concentrate in a creative activity that makes you happy and a physical one that liberates your energy. In a nutshell, to find the combination that help us reach a balance between the body and the mind. What about Yoga? Or better yet, Hot Yoga? Our studio has a temperature of 40 degrees Celsius that warms your limbs and joints and allows for a better practice. This enables your skin, blood and muscles to detox through your sweat, plus many other benefits that you can read about here. Our skin is the largest organ in our body and thus it is a reflection of our health. At present it is of the upmost importance to keep it hydrated; we’ve just arrived from the Summer, from all of its excesses and parties, its sun, sand and food, which, many times, isn’t exactly the healthies there is. We’re now at the perfect moment to begin, or recover, healthier habits. It is recommended to use a special cream, depending on our skin time, to massage our legs, arms and feet after a shower and before going to bed. The next day you will notice the change. Remember, your skin will thank you for these small, but daily, routines. Your face is exposed the most to pollution and changes in the weather, that’s why you need take special care of it. Remove your make up, tone up, keep your face hydrated and protect it from the sun. These are the four steps that you must follow to have a healthy and radiant skin. And, of course, you need to keep your feeding habits in check by eating seasonal fruits and vegetables.